Careers in technology, and particularly, deep-tech startups are becoming increasingly exciting and prolific. A quick google will give you countless blogs and videos that promise to give you top tips on why and how to build your careers. But what’s it actually like? 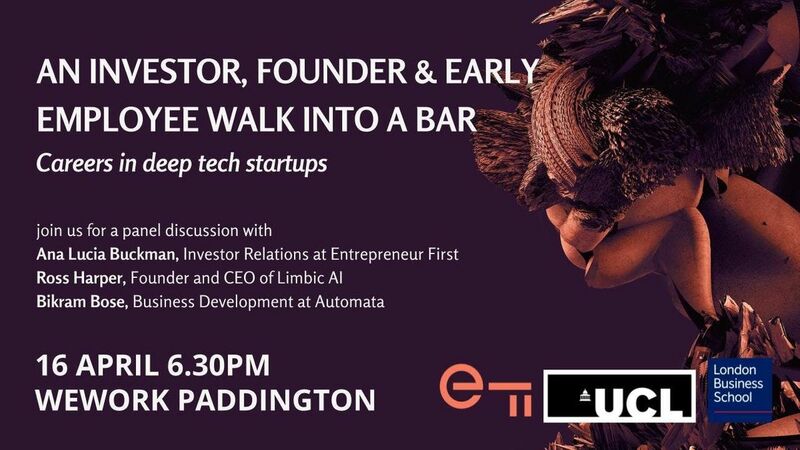 We’ll hear from three individuals with unique perspectives on working in London’s deep-tech startup ecosystem - an investor, a founder and an early employee. They’ll share their thoughts on the startup ecosystem, the journey they brought them to where they are, and their advice on how you can think about careers in the sector. Ana Lucia manges Investor Relations at talent investor Entrepreneur First. Unlike other VCs, EF invests in individuals they believe have the potential to found a deep-technology company, at the earliest possible point - before they have a team, idea or company. They then support those individuals to find a co-founder from a pool of exceptional peers as committed as they are, develop a globally ambitious business idea and then raise money. Ana Lucia joined the team that helps EF founders build up their business and connect with leading VC’s around the world. She brings a doubly interesting perspective - what does EF look for when investing in people, and what do VCs look for when investing in companies. Prior to EF, she completed her MBA at Wharton and INSEAD, worked in startups, mentored founders and spent some time in the US government. Ross Harper is the founder and CEO of Limbic AI, a platform that enables developers to quantify how their users really feel at that moment, by applying machine learning to biometric data collected by wearable devices. Their first focus: helping to recognise mental health issues as early as possible. His company’s technology has only been made possible by recent advances in AI and wearable sensors. Before starting Limbic, Ross completed a PhD in Computational Neuroscience at UCL and a Masters in Neuroscience at Cambridge. Since raising seed-funding last year, Limbic’s team of scientists and developers are working hard to ensure apps can become ’emotionally intelligent’ for the first time. Bikram Bose is the Business Development Manager at Automata, an early-stage robotics seeking to democratise the benefits of automation. How? They’ve produced a low-cost, lightweight and easily programmable table-top robot that can be used for any repeatable task, perfect for small to medium sized factories and manufacturers who otherwise might not be able to afford or need complex robotics systems. He leads on a range of commercial activities, such as the overall go-to-market strategy working closely with the co-founders. Before joining Automata, which is an Entrepreneur First company, Bikram practiced law in India before completing his MBA at LBS in 2017. Like all good events, you'll find pizza, beers and plenty of time to network with the speakers and others attending.